Newly furnished 5 bedroom, 4 bathroom home, featuring natural woods and the work of local artisans throughout. Custom master suite with walk in closets, bath and library with extra sleeping futon. 4 additional bedrooms serving your extended family. Library provides quiet space for business needs, wifi and printer. Direct bluff frontage on Lake Michigan with steps to beach and nearby public access to Lake Leelanau. Know that your rental dollars from this property will also be given back to the community. We have contributed a percentage of rental income to the Leelanau Conservancy for dune and water preservation and to programs for children with medical and psychiatric issues in the state of Michigan. Let your vacation make a difference! We have been coming up north since my grandparents bought a home on a small lake near here 70 years ago. Some of my own fondest memories are of watching the stars, taking walks, kayaking the Crystal River, swimming, finding Petosky stones, skiing, eating ice cream and hiking the dunes. I hope that you and your family enjoy all that northern Michigan has to offer. As a University of Michigan faculty member, active in children's health, I am also deeply committed to raising healthy and resilient children and supporting families. I bring this passion to both my work and my leisure. I know how precious vacation time is with your family and friends. Savor the moment, these are truly some of life’s most special memories. Take pictures, take a walk, take moment to enjoy the breathtaking view from the deck and to just 'be” with your family and friends. We hope to make a difference preserving the beauty of the local community and supporting youth and families in the state of Michigan; donating 5% of rental dollars to The Leelanau Conservancy and programs supporting medical and psychiatric needs of children and military families throughout the state. Know that your enjoyment of this property serves those in need and helps maintain the beauty of the Leelanau Peninsula. Gorgeous bluff view and Lake Michigan frontage as well as public access to Lake Leelanau. Home well suited to needs of large family with many private spaces; and outdoor buildings for art work or children's play spaces. This home also features art and furniture of local craftsmen. This location provides your family with many options for hiking, exploring wineries, biking, water sports, great food and breathtaking natural beauty. Check out Fishtown in Leland! Quain villages of Leland, Glen Arbor, Suttons Bay, Northport and Lake Leelanau provide great shopping, wine, spirits. Access Lake Michigan from this private bluff frontage. Beautiful view of Lake Michigan on top of this bluff lot and access to the lake down a series of stairs. Plenty of Petoskey stones! The winter beach is amazing too. Land line in kitchen, living room and office/loft. Bed linens are on beds upon your arrival. Stack-able guest laundry in separate laundry room. Bathroom and kitchen towels are in closets and drawers. NO beach towels provided. Formal living space with window wall looking out to deck and Lake Michigan. Sectional sofa and chair as well as 2 floor lamps and coffee table. An adequate sized dishwasher provided. 2 ovens. with hot pads/mitts provided as well as trivet tiles. An adequate sized microwave provided. Basic spices as well as some paper products and storage containers pitchers mixing bowls and food wraps. Dishes, flatware and glassware for maximum number allowed. Also, plastic ware for outdoor use. Essential utensils, cutting boards, ceramic pot and pan set, many small appliances. Bluetooth speaker in formal living room. One DVD player in family room. Plenty of interesting fiction and a few local historical books. Pretty perennial garden, mainly natural setting with a small area of "lawn" on street side of home. Kayaks can be rented in Leland; and are available for public access to Lake Leelanau. No helmets provided- so please bring your own to use these older style bicycles. Multi- level deck with table and chairs, as well as wood deck style boardwalk. A few water toys in the attached garage. Enjoy custom artworks, and fine woodwork with nautical prism skylights and fun tile work throughout. Whimsical touches throughout the interior lovingly maintained. Outdoor views are stunning all four seasons. Bike to the vineyards or to quaint Leelanau towns. Great location for wine tasting. Water levels permitting - walk to Leland on the beach. Enjoy the hundreds of Petoskey stones on our private beach. While housekeeping is not provided during your stay, we do charge a fee included in your total rental payments to have the home cleaned by our housekeepers prior to the next guests stay. We ask that the home be used by renting families. No large parties are to be held on the property. The home was spacious and well appointed. The location was perfect. We had our family reunion here the last week of June, and it was without a doubt the best venue we've ever had. Our 3 'sub-families' (3 couples, 2 with children) each had their own space of 2 bedrooms and a full bath. This house is amazingly beautiful, the decor is lovely, and it offered everything we needed! The kitchen is so well appointed, and the whole house is very comfortable. We can't think of anything we would have changed. I thought that the 90+ steps to the beach would be a detriment, but they became a challenge to everyone -- how fast could we go up?! The sunsets were absolutely breathtaking, and the beach was awesome! Highly recommend this VRBO! Great home, hosts and location! Shared home with generations to celebrate an upcoming wedding. Gorgeous views, and great spaces for a multi generation family. Kitchen with everything you need. Ideal location for exploring leelanau. Hundreds of Petoskey stones on beach for kids to explore. Nice and clean with comfy beds. Beautiful and well maintained property that is ideal for housing multiple couples or extended family gatherings. The stairway to the private beach is long but solid, with very good hand rails. Beautiful deck. There are many places for people to gather, or to find a quiet place to read. We appreciated the large dining room table. We thoroughly enjoyed our weekend at this house, it was perfect for our extended family of 10 people. Great location close to Sleeping Bear. Breathe. Relax. You are now Up North. Enjoy the beauty of the Leelanau Peninsula all four seasons with stunning views over Lake Michigan. In summer, travel by bike through lush cherry orchards and vineyards; walk the beach, swim and fish. In winter, cross-country ski and enjoy family time by the fire as you enjoy the early sunset over the lake. Our home sits on a bluff above Lake Michigan, with stairs leading to a sandy beach. Its wooded lot provides plenty of privacy. The property is also within short walking distance to shared frontage on North Lake Leelanau. An airy 5BR/4BA retreat, our home can easily accommodate a family or a group. It features three fireplaces, maple wood floors, large bay windows, a back deck overlooking the lake, and finishes and furniture featuring local craftsmen. The kitchen has granite counter tops, custom cherry cabinets, and a gas range. The master suite contains its own fireplace, library and a lake view. Lovely details include ash beams and paneling, and several skylights. The rooms provide some quiet spaces for those wishing to read or for business needs. In addition to the main house, the property has a large detached garage. We hope that you and your family enjoy all that northern Michigan has to offer. It is truly a special place! In an effort to give back to this wonderful community, yearly, we plan to donate 5% of all rental dollars to help support its farmlands and dunes, and Michigan families with medical and mental health issues. 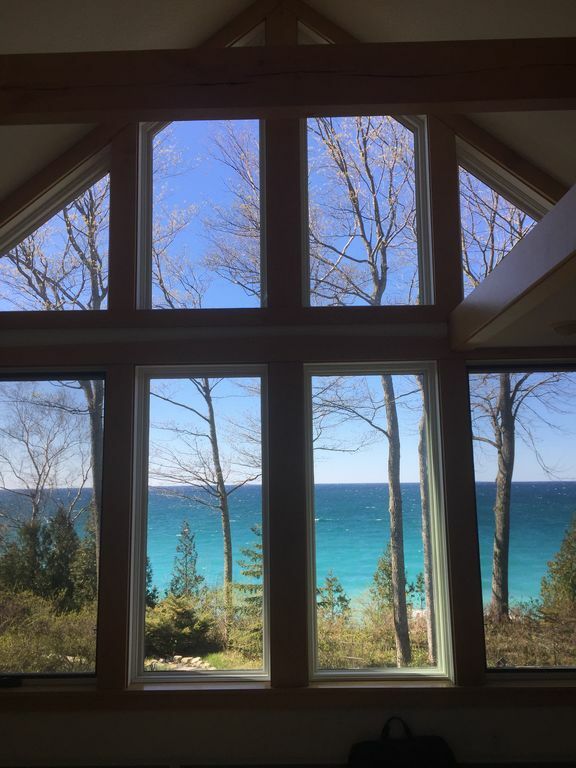 Your choice in renting this home will provide monetary support to the Leelanau Conservancy, and to high risk children and families served by the University of Michigan in outreach programs throughout the state. Thank you for selecting this home to both provide you with a wonderful vacation and to bring back to the communities of northern Michigan. Now, kick back and enjoy! Take an early morning swim in Lake Leelanau or Michigan if you are brave. Take an early morning walk on Lake Michigan and look for Petoskey stones. Enjoy your coffee from the deck. Ride a bike. Great maps provided. Go to Leland –if you like the tiles in our home buy a few to take home (Spork). Check out Cherry Republic in Glen Arbor. Pick some cherries and make a pie. Spirits at Leelanau Distillery and wonderful coffee at Leelanau Peddlers. Read a book (or two, or three)…if you have a child with you - read to them too! Look at the stars. Fall asleep to the waves. Full week guests will be given first consideration. Minimum stay requirements of 3 nights for shoulder seasons. Note: Rates are listed for 2017 and are subject to change in the future. Also, your dates are only reserved once payment has been made AND your Formal Agreement( sent via USPS) is completed and returned to the manager within 14 days of initial booking. We do not "hold" dates without the initial payment and signed, initialed and completed hard copy agreement. The pdf file of our agreement is attached to your booking request, pleases read this prior to checking your assent as this is your time to not continue. We can no longer accept echecks. If you use an echeck for payment you will incur a bounce check fee if the payment is reversed by vrbo.